For the first time ever, air traffic researchers can view and analyze archived flight data collected and merged from all air traffic facilities across the U.S., with fast update rates ranging from one second to 12 seconds for every flight’s position. Previously, researchers only had access to national flight data that was similar to internet flight tracking, with one-minute flight updates and no information about flights on the ground at airports. Or, they had access to separate flight data sets from 77 different Federal Aviation Administration (FAA) air traffic facilities, which made research very challenging. 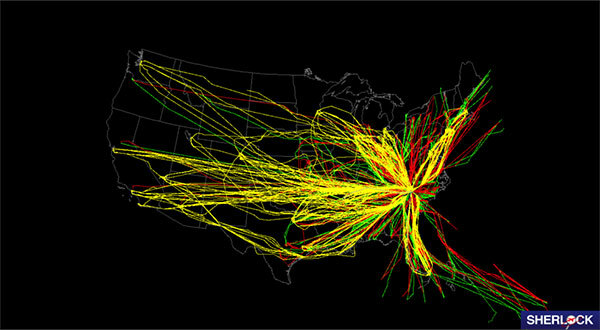 NASA’s newly improved tool, the Sherlock Air Traffic Management (ATM) Data Warehouse, merges all of the air traffic facility data to produce analysis-ready, end-to-end flight information at these improved resolutions for the entire U.S. airspace. NASA is committed to transforming aviation by dramatically reducing its environmental impact and improving efficiency while maintaining safety in more crowded skies. Sherlock will help air traffic management researchers quickly perform large-scale analyses of the U.S. air traffic system, to look for areas where ideas for improvement will have the most benefit in terms of environment, safety and efficiency. For example, it allows researchers to use actual flight data to answer questions such as, “How much fuel could be saved if all flights into the San Francisco Airport used lower power for their final descent?” Or, “Would more accurate departure schedules reduce delays into busy Northeast airports, and at what rate?” Since new technologies are so costly to deploy in the complex U.S. airspace, finding the regions where they will help the most is very important, as is predicting the benefits to the flying public. In development since 2009, Sherlock is a crucial piece of the air traffic management research infrastructure used by NASA and its partners. Sherlock includes a traditional database, a big data analytics system, web-based user interfaces and several tools for query and visualization. Located at NASA’s Ames Research Center in California’s Silicon Valley, the Sherlock ATM Data Warehouse team overcame challenges in correlating and rationalizing data from the 77 different FAA air traffic facilities, often with overlapping and conflicting positions, flight plans, as well as time and airspace references. The raw data include a variety of flight information from live streams of operational facilities, weather observations and forecasts, and other information collected from the FAA, such as traffic advisories and delay status. Sherlock contains over 36 terabytes of raw data, with more collected daily. The merged flight data will soon be available for all of the archived data going back to 2011. This will enable researchers to look at very large data sets of many billions of flight tracks, and at trends in the national traffic picture over the past five years, which in turn will help predict future traffic. While in development, Sherlock supported many research studies with separate FAA flight data. Sherlock’s merged data will streamline future research, such as estimating fuel savings and predicting the time savings that new air traffic control tools will provide. Planned enhancements include the capability to integrate the national flight data with weather data, to show, for example, how flights moved in relation to thunderstorms or other weather events. This post was originally featured on NASA.gov by Sharon Lozano, NASA Ames Research Center.